New York-based saxophonist/composer Pete Robbins joins Playscape Recordings roster with his second release as a leader, Waits & Measures. Recorded and mixed by Jamie Saft, Robbins' sophomore effort features his working sextet. "On this new recording," writes critic Mark F. Turner in the liner notes, "Robbins clearly has an acute understanding of jazz as an art form, but more importantly he is striving to create music that moves in new directions. The group has gelled into a tight unit, creating music based on the ebb and flow of spontaneous invention. Robbins has again impressed me with is abilities as a musician, a serious composer and an artist with a vision to create music that is progressive, yet always engaging." This is quirky 21st-century jazz, ably performed by a forward-thinking sextet that transforms a cerebral sound into something visceral. Robbins' music demands that the listener be unobtrusive and allow the musicto unfold layer by layer, which it does, with dizzying speed. The result isa maddeningly superb array of jazz and funk, with notes squatting to be fittightly between the tempo changes. Waits & Measures is a lovely reminder ofwhat a jagged rhythmic whim can do when paired with an extraordinary ear fortonal congruency and a restless, but measured, inability to wait. ...this intriguing new Playscape release, a sextet effort, will definitely appear on many Best-of-2006 lists. Ours, for one. Robbins' music is consistenly intriguing...the freewheeling yet controlled mood of the music is quite original and the main reason that this music is recommended. 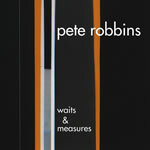 Waits and Measures (Playscape), the new album by the alto saxophonist Pete Robbins, is an intimate sort of jazz-rock hybrid complete with Fender Rhodes electric piano and artfully fuzzed-out electric guitar.